September 25, 2014 by Ecommerce News. About Statistics with tags Europe, France, Germany, The Netherlands, The United Kingdom. 5834 views. Online grocery shopping is getting more and more popular. In fact, the global online grocery market is expected to grow with 25% over the next five years. SyndicatePlus believes online grocery is the next frontier in ecommerce and took it upon themselves to map the European online grocery shopper. Let’s have a look at their study. SyndicatePlus interviewed 250 consumers, living in Germany, the Netherlands, France and the United Kingdom, who recently bought groceries online. This information combined with desk research resulted in a comprehensive study about the European online grocery shopper. One of the key findings of this study is that the average online grocery shopper is born between 1965 and 1994, lives in an urban area and has a high level of formal education and relatively high income. And for online consumers, it’s mostly the freedom to shop online whenever they want that drives them to shop groceries online. The extra cost of home delivery on the other hand is the main deterrent. And when they have decided to shop online for groceries, consumers care most about product pricing, width and depth of the product range and order delivery costs. The Dutch product data management platform also looked at how consumers like to shop and it seems that online grocery shopping drives greater spending but occurs less frequently than in-store. Also, consumers favor non-perishable over perishable products when they shop online. The research suggests that consumers only occasionally buy groceries online compared to buying such products in physical stores. 67% of respondents shop online for groceries once a month, while 73% visits physical stores once a week or more. The ‘traditional’ PC or laptop is still the most used device to shop online, but mobile is catching up fast. Almost six in ten respondents said the PC or laptop is their preferred device for online grocery shopping, while 28% used smartphones and 26% shopped online using their tablets. Together, these mobile devices were being used by 54% of all respondents. There’s also a significant number of respondents (13%) who use both PCs/laptops and mobile devices to shop online for groceries. 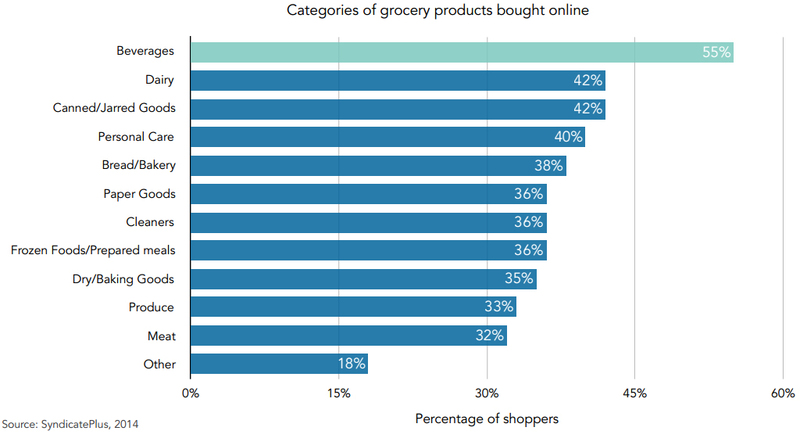 When looking more thoroughly at the product preferences of online grocery shoppers, it becomes clear that the most popular grocery products purchased online differ strongly from the most popular in-store purchases. Online, beverages are the absolute favorite type of product with 55% of all respondents claiming to buy them online. Dairy products and canned/jarred goods are also very popular online. Least favorite are meats and fresh products. Shopping for groceries online is one thing, the groceries also need to get in the fridge eventually. Today’s online grocery shoppers in Europe prefer to have their products delivered to their doorstep (81%) rather than getting them at a pick-up point (19%). Only in France are pick-up points are as popular as home delivery. That’s no surprise as this country has the largest pick-up point network amongst all of the research countries. See also our article: Click & Drive extremely popular in France. Main reasons to shop for groceries online are: “I can shop online at any time I please” (said by 50% of respondents), “It’s convenient to have the groceries delivered to my front door” (44%) and “I don’t have to carry heavy items home” (37%). German and French consumers are fan of shopping whenever they please, while Dutch and British consumers most value the convenience of home delivery plus not having to carry heavy items home. When consumers shop groceries online, they see product pricing and product range as the most important criteria for choosing an online grocery retailer. These are most prominent in Germany and the UK, while Dutch consumers put value to a wide range of factors. “This suggest a need (and opportunity) for Dutch retailers to improve their online grocery services”, states the research. 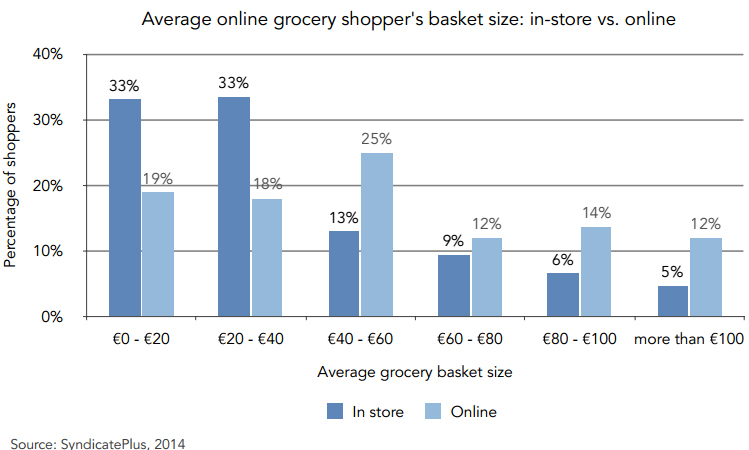 High delivery costs are the biggest barrier (20%) for online grocery shoppers in Europe. 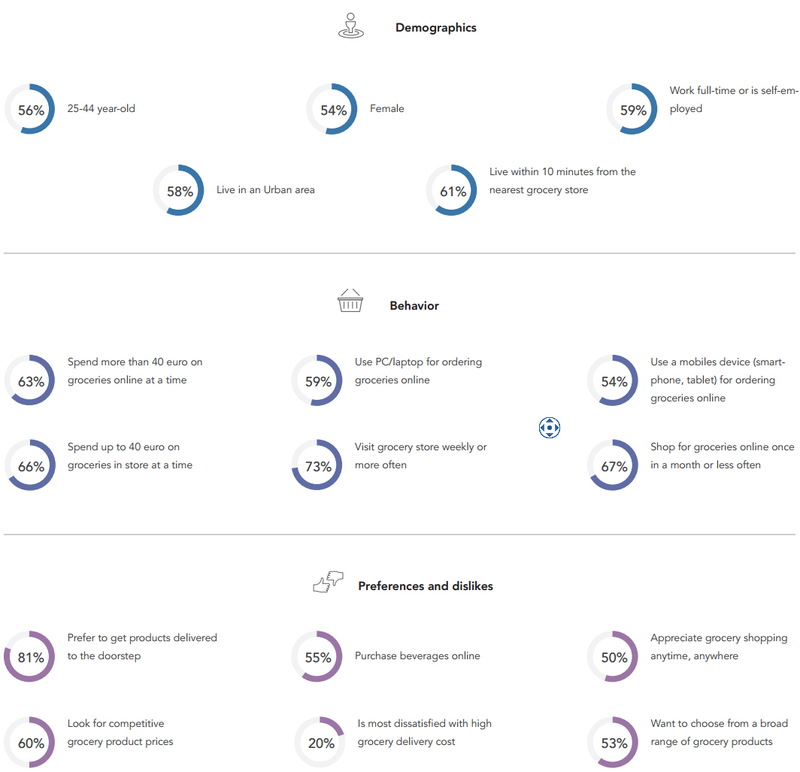 Other factors deterring them from purchasing online are: “Home delivery time slots are inconvenient for me” (said by 18% of respondents), “I prefer to touch and judge products myself” (17%) and “I like to go grocery shopping in physical stores” (15%). More about Europe, France, Germany, The Netherlands or The United Kingdom.